Results from Baccarat Simulations Series 15 are presented below. In this series, I examined Michael Brannan’s Ultimate Baccarat. 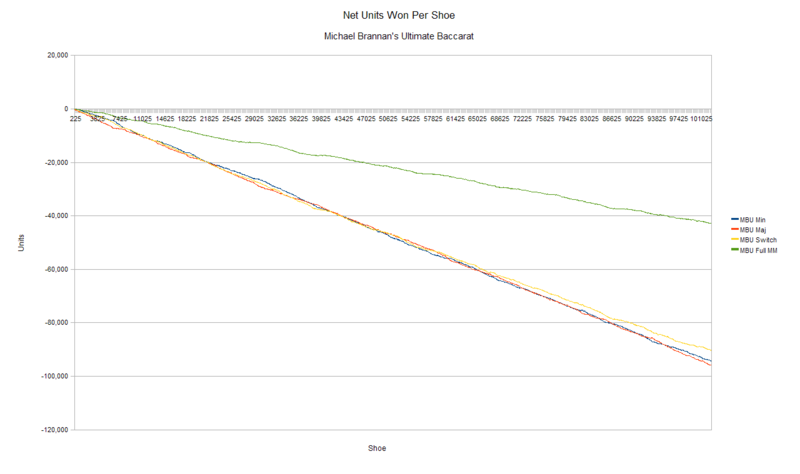 Read a discussion of the results in the post Brannan’s Ultimate Baccarat: Dis-Advantaged Play. This entry was posted on November 1, 2010 at 10:23 am and is filed under Life with tags analysis, baccarat, baccarat simulations, baccarat simulator, banker, bet, bet progression, casinoedge.com, data, flat betting, majority, method, Michael Brannan, minority, money, money management, player, results, shoe, strategy, switch, system, testing, trigger, U1D2M2, Ultimate, Ultimate Baccarat, Wizard of Odds, Zumma, Zumma 1000, Zumma 600. You can follow any responses to this entry through the RSS 2.0 feed. You can leave a response, or trackback from your own site. First of all, great site. I’m just wondering, on Brannan’s UM, on what is the criteria or the trigger that would indicate a switch from MIN to MAJ. I’m intruige about applying his method. It seems like it’s an option to delay the inevitable. I’ve been playing Baccarat since they opened up here in AC. There is an added excitement with the opening of the new REVEL on the boardwalk. Please relay the info about the switch criteria. Thanks for your help and attention.